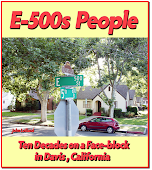 Watching PBS’s Newshour on August 25, it was hard to believe that I was suddenly viewing a video of Dr. Herbert Bauer driving a car past my house on E Street toward 5th. He whisks by the Granucci and Tingus homes and stops at the 5th & E corner as a taxicab looms and zooms by (images 1 through 5). 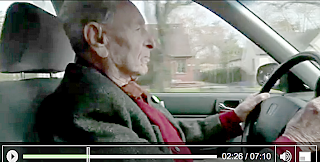 What struck me as odd about this scene is that the filmmaker was obviously orchestrating where Bauer was driving for the purpose of showing the hazards of old people driving--Dr. Bauer being 99 years old at the time the video was made. 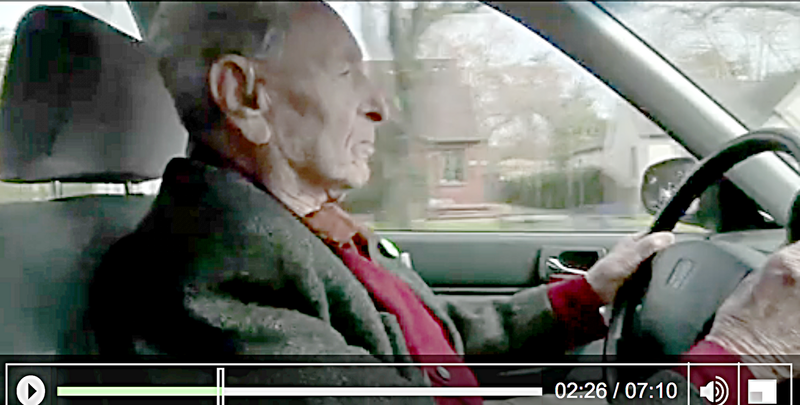 Intended or not, the filmmaker took Dr. Bauer to one of the most dangerous intersections in Davis as a context in which to display the thesis that at least some old people should not drive. My dismay is not only that an older person was put in harm’s way for the purpose of making a movie. That is, no one of any age should be taken to 5th & E! That aside, here we have a filmmaker steering a person who is about to give up driving to exactly the kind of place he should presumably not be driving.